As the cooler months approach, it’s time to start thinking about how you’re going to keep your home comfortable through the winter. Did you know that the same window film that keeps your home cool in the summer also keeps it warm when it’s cold outside? Carolina Solar Security offers All Season Window Film, which benefits you year round. 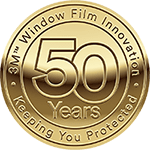 If you’re wondering how a single film can do it all, let’s take a look at how 3M’s All Season Window Film works. About 28% of cooling expenses come from solar heat gain through windows. All Season Window Film keeps your home cool in the summer because of its high heat rejection properties. After we install window film in your home, your HVAC system runs more efficiently, because the film rejects up to 79% of the sun’s heat. Your HVAC maintenance costs also decrease in the long run since they don’t have to work as hard to keep your space cool. Many coastal homes have huge, beautiful windows boasting expansive views of the ocean or sound. Unfortunately, those regal windows lose up to twenty times as much heat as an adjacent wall of the same square footage. All Season Window Film insulates your windows to keep warmth inside your home during the colder months, while allowing you to maintain — and even enhance — your view. At Carolina Solar Security, we realized that most people don’t understand that they will reap the benefits of window film year round when they come to us for help with problems like hot spots, UV damage, and glare. Window film does in fact solve these problems, but it also provides insulation in the cooler months. Carolina Solar Security is a Prestige Authorized 3M™ Dealer in Wilmington, NC. We have been providing Southeastern North Carolina with all season window film solutions since 1985 and never stop working to bring our customers the best products paired with the most skilled window film technicians. Reach out to us for your free quote today!